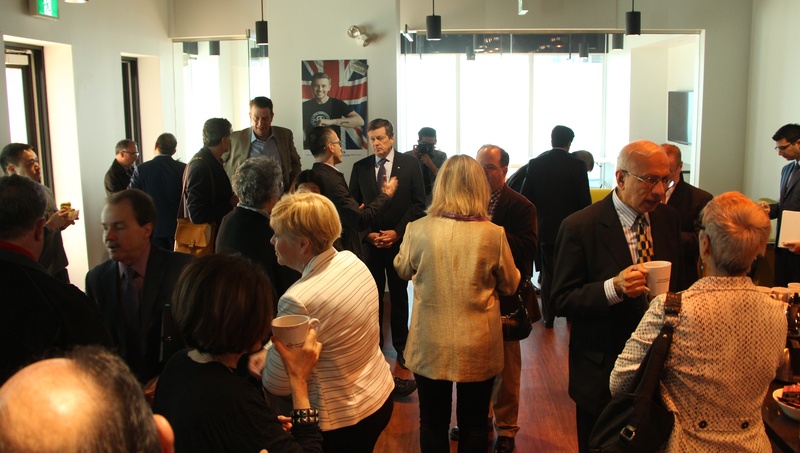 The morning of Monday May 9th saw an early crowd gather for the annual Mayor’s Breakfast hosted by the West Queen West BIA, in the Restaurants Canada building located at 1155 Queen Street West. 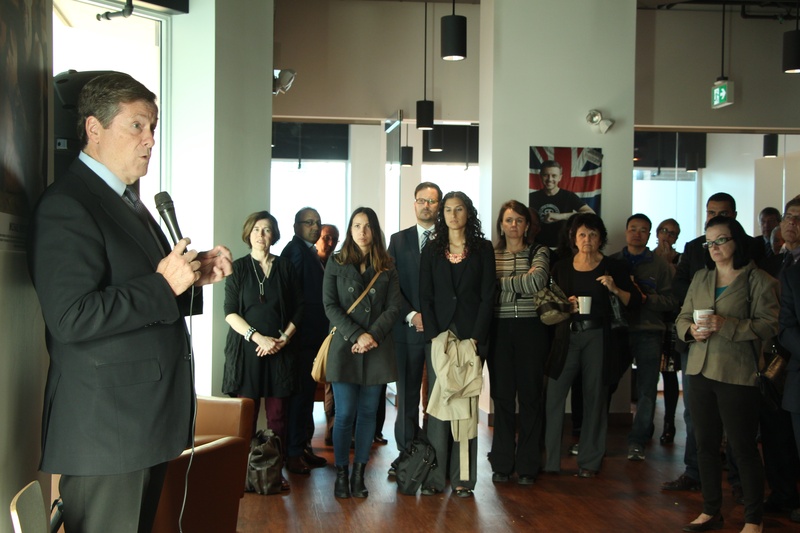 The invited guests attended a breakfast reception with John Tory for the hour-and-a-half event with the spotlight squarely on our city’s growing needs. The mood was lighthearted and jovial with various refreshments served, as well as breakfast goodies including omelette sandwiches and waffles prepared by the staff of Lisa Marie. Restaurant Canada is a not-for-profit organization that oversees industry concerns from their 30,000+ members. There are currently 140 ‘official’ neighbourhoods in Toronto which are represented by 81 BIA’s, including West Queen West, who offer invaluable support to their members. Several city councillors along with MPP Cristina Martins and John Kiru of T.A.B.I.A were at the event as Tory spoke to a crowd of about 50 regarding the ongoing developments made in Toronto. Tory, an engaging speaker, voiced his own progress in fairing up to promises made at election time; notably the pledge to not increase property taxes. With all eyes on how economic development can benefit the city as a whole, Tory described his past trips abroad as a way to sell Toronto to investors and diversify our economy. The Mayor spoke candidly about his desire to see Toronto project itself into new innovative initiatives, including using technology to implement faster public services for Torontonians such as registration fro rec centres. The event ended with a lengthy question-and-answer session in which Tory spoke to various concerns brought up by members of the BIAs including whether it was possible for Toronto to host Expo 2025 (possible if only the provincial and federal governments agree to funding) and how the legalization of marijuana could affect areas like West Queen West–which has two dispensaries. 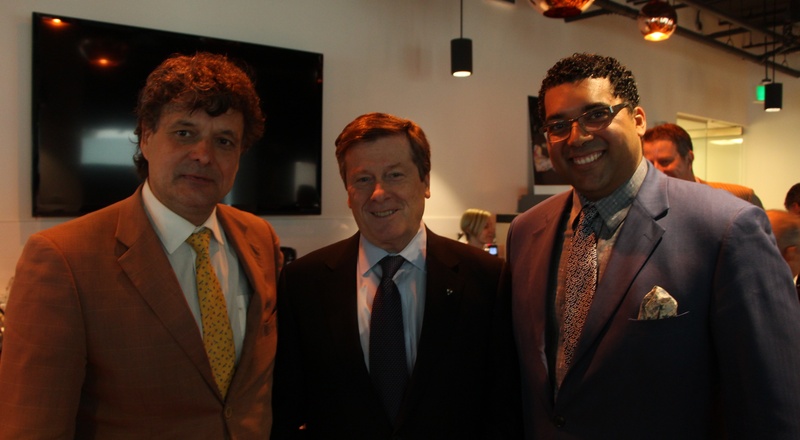 Tory recanted a humorous tale of visiting a downtown marijuana shop on the weekend, a detour from the usual mayoral duties.